Thomas is based on the Billinton E2-Class 0-6-0T locomotives built for the London, Brighton and South Coast Railway between 1913 and 1916. He is apparently one of the last batch built as only these engines featured his distinctive extended-side-tanks, projecting forward over the leading wheels and little downsweeps at each end of footplate. The E2s were introduced in 1915 to replace earlier members of the E1 class, which had been scrapped. The last five in the ten strong class had extended side tanks to give a greater water capacity, but all engines had two inside cylinders and driving wheels 4'6" in diameter. 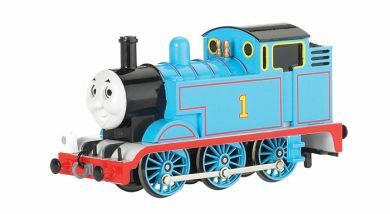 Thomas is painted in the NWR's standard blue livery with red-and-yellow lining and the number "1" painted on his tank sides in yellow with a red border. In the Railway Series, he carries two builder's plates on the sides of his cab.